I have slept in strange places in my life, even with a buffalo tied to my bed, but I had never slept with 200 monks. 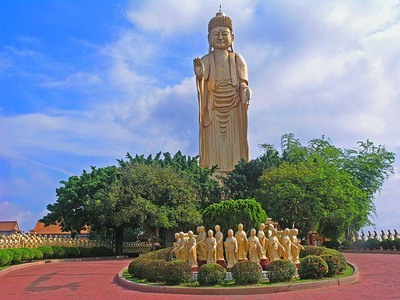 It tickled my imagination for days but when we arrive in Fo Guang Shan, there are no monks. They have gone to Taipei to celebrate the Buddha’s birthday. I expect we passed them on the way down but at 300 km an hour on the bullet train, I failed to notice. 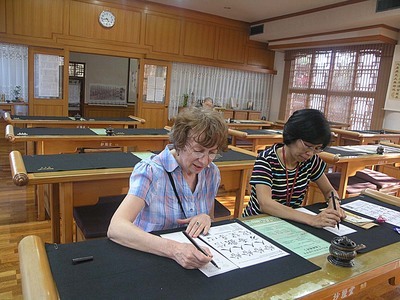 Fortunately the nuns are home and Miao, our delightful chaperone, ushers us straight into the calligraphy hall. Shoes off, sit up straight, trace characters, easy. 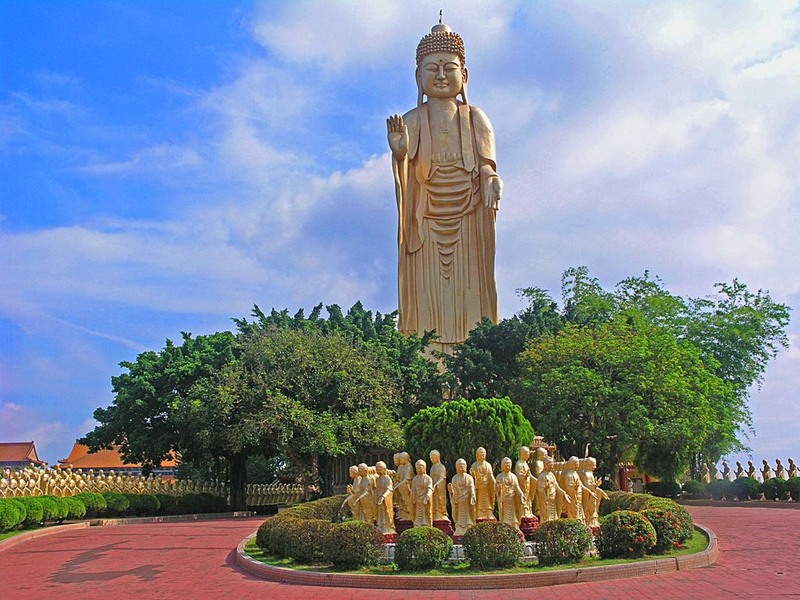 Not so, my hand wobbles, jetlag or troubled mind…Up on the hill, the giant Buddha glows in the setting sun and the barking frogs begin their nightly chorus on the edge of the lotus pond. Whistling frogs and cicadas join in, garlands of lights twinkle on the pagoda roofs. I am in fairyland. Fo Guang Shan is not your usual kind of monastery. Set in the lush hills of southern Taiwan, it is a happy place where monks and nuns in coolie hats and brown robes work from morning to night to create heaven on earth. ‘Humanistic Buddhism’ was born right here in 1967, a new age enterprise that would surely please Sir Alan Sugar. There are guided tours, with golf-style buggies for the less able, shops, restaurants, museums, college, art gallery, chortens for the dead and lodges for the guests, not quite sleeping with the monks but close enough. And it's good to know that beyond running costs, funds sustain all sorts of charity work. Tonight we dine on auspicious noodles served in vegetarian broth and I retire to my cell, nothing plush, just en-suite, TV and air conditioning. Lights out at 10.00, up at 5.00. Guests don't have to follow the rule but I am keen on morning chant. Today Miao is in charge of the drum and the beat keeps me wide awake. 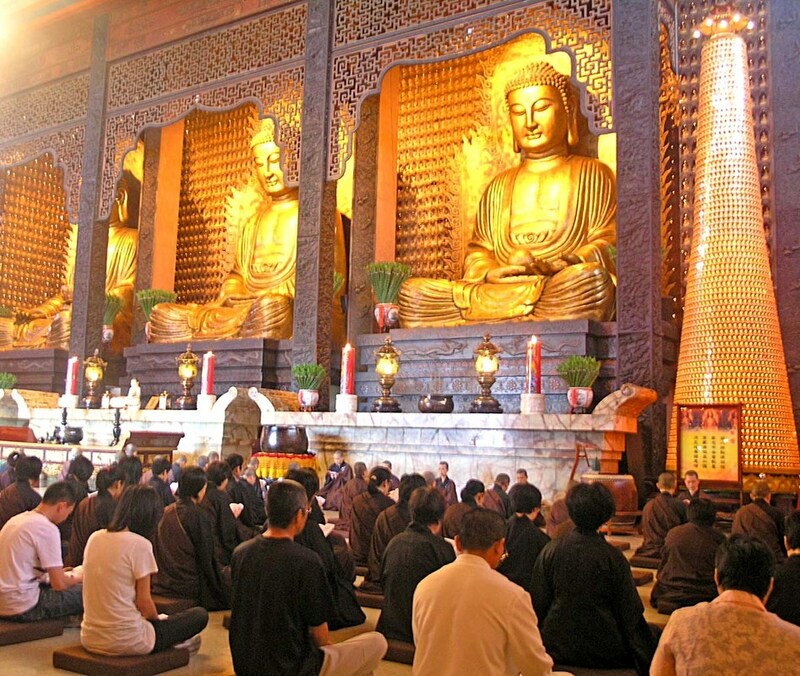 Unable to read the script, or even prostrate, I feel all eyes on me, no monks, only nuns and 14 800 little Buddha tucked along the walls and myriad more climbing up the jewelled pagodas. The three big ones on the altar hint a forgiving smile. 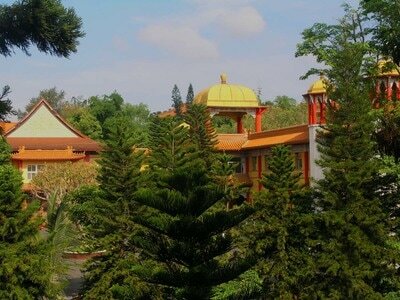 ​Breakfast is eaten in silence then monastic life revolves around teaching, cleaning, cooking, gardening, visitors and business, punctuated by the clapping of a wooden board for meals and prayers. 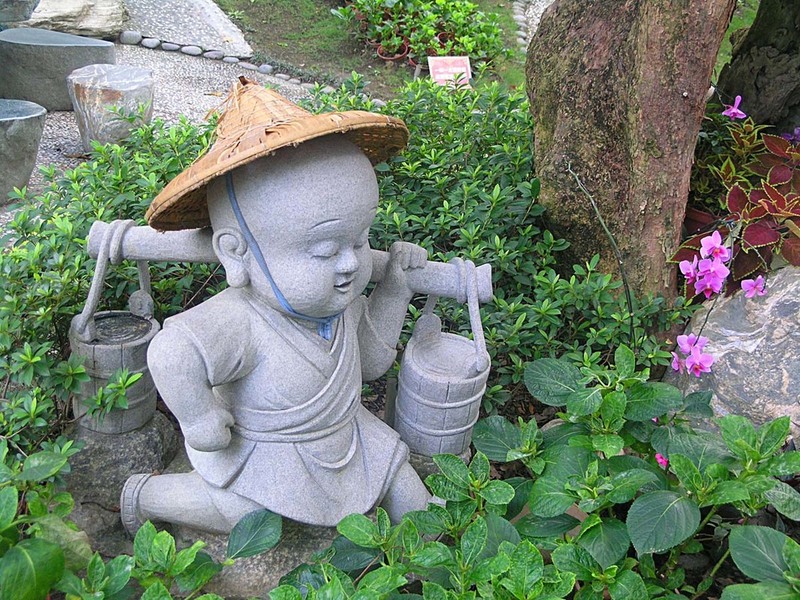 Miao shows us the shrines, pavilions, cool colonnades, sunburnt plazas and chubby stone novices peeping in flower beds, dangling prayer beads on their feet. In the Pure Land Cave, we enter a disneyesque vision of heaven with talking birds and celestial maidens, a fanciful idea of paradise but in Fo Guang Shan, hell has no place. I like that. The first tourist coach arrives and the driver sits in the shade to read the paper. 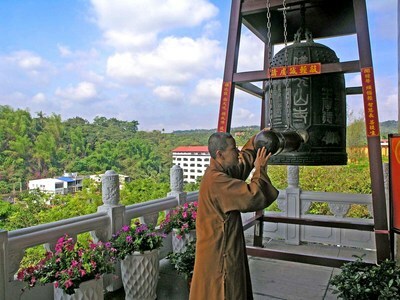 They are an impressive sight, I must say, and gazing at the giant statue on the hilltop, I prepare to strike the mighty wishing bell and promise to time it better, next time round.